SALT LAKE CITY, Utah -- DigiTech today announced the introduction of its iPB-10 Programmable Pedalboard, the world's first programmable pedalboard using the Apple® iPad. By harnessing the power of the iPad, the iPB-10 combines the simplicity of a pedalboard with the flexibility of a multi-effect system. In conjunction with the iPB-10, DigiTech also announced the introduction of the iPB-Nexus app for iPad. This app gives guitar players drag and drop pedalboard design functionality. It also includes the My Tones library where users can store and organize presets. Also included is a real-time performance view where users can see each pedal and its settings. Together, the iPB-10 and iPB-Nexus allow guitar players to design their ultimate pedalboard . Users can drag and drop up to 10 different pedals, in any order, to each pedalboard, and can even add an amp and cabinet to complete each setup. With 87 different pedals, 54 amps, and 26 cabinets to choose from, the number of different guitar tones users can create is virtually unlimited. By using the touch gestures of the iPad, guitar players can rearrange the pedals in their signal chain, turn them on and off, or to adjust their settings. The iPB-10 Programmable Pedalboard allows users to save their setups with the touch of a finger, and instantly recall them with the stomp of a foot. Now, guitar players can have a different pedalboard for each gig, set, song, or even switch pedalboards within a song. The iPB-10 Programmable Pedalboard is not simply a dock for the iPad. It uses multiple Audio DNA2™ processors within the unit to provide users with no-latency, high-definition signal processing. "With the ultra-secure iPad mounting system and the no-latency, high-def processing, we have brought the power and infrastructure of the iPad to bear in live performance situations." said Urry. "You can count on seeing a long line of enhancements and features available in future upgrades via the Apple App Store." Urry added. 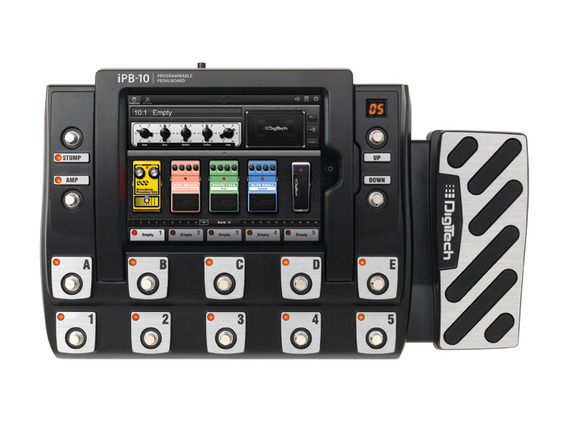 The DigiTech iPB-10 will begin shipping in June 2011 at $699.95 suggested retail price and $499.95 US MAP. The iPB-Nexus app for iPad will be a free app available for download from the App Store.